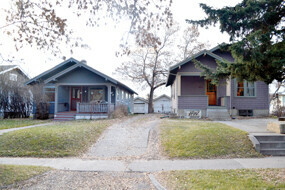 Bozeman’s South Tracy Historic District is a unique island of Craftsman bungalow residences on the 800 block of South Tracy Avenue. Sandwiched between West College and West Harrison Streets, the seven homes on the east side of South Tracy Avenue constitute Bozeman’s smallest historic district. The district reflects the need for modest, affordable residences created by Bozeman’s growth in the 19teens. The development pattern of the South Tracy District is notably different from the Bon Ton Historic District a block to the west. Though houses in these districts share construction dates, the residential density in South Tracy is higher than in the Bon Ton. Seven residences line the east side of the 800 block of South Tracy Avenue while a block to the west only four homes are on the same block of South Willson Avenue. Built between 1916 and 1923, the modest residences in the South Tracy District share a distinct rhythm of building massing and scale, setbacks from the street and architectural detailing. All of the homes are finished in the Craftsman style, at the height of popularity in the 19teens. The Craftsman bungalow style evolved from a variety of sources, including buildings on the Indian subcontinent and the Arts and Crafts movement popular in California at the turn of the 20th century. Architectural style guidebooks note that residential buildings in the Craftsman style are identified by their low pitched, gabled roof with wide eve overhangs, exposed roof rafters and full or partial width porches with porch roofs supported by square or tapered columns that sometimes extended to the ground. Retailers like Sears and Roebuck and Montgomery Ward helped popularize the Craftsman style across the United States by selling plan sets for Craftsman style houses in their mail-order magazines. A consumer could even order the kit for an entire house, including framing, siding, windows and trim, to be delivered to a building site. The residences in the South Tracy District were adapted from house plans by four local carpenters as speculative investments meant to be sold upon completion. William C. Smith constructed the first house on the block at 802 South Tracy Avenue in the late fall of 1916. The National Register nomination for the house notes that 802 South Tracy is a bit more elaborate in detailing than other Craftsman bungalows in the neighborhood. The house was originally owned by Charles M. Fisher, whose brother-in-law Fred Willson became Bozeman’s primary architect between 1910 and 1957. Willson designed a more impressive Craftsman residence at 602 West Story in 1914, and may have applied those skills to dressing up the house on South Tracy Avenue in 1916. Smith also constructed the home at 806 South Tracy sometime between 1916 and 1920. D. Harvey Budd was an early owner of 806 South Tracy. Budd ran a plumbing business which thrived in Bozeman’s booming residential construction industry. Three more Craftsman bungalows were built or under construction on the block by the end of 1917. George Wimmer began construction on the house at 814 South Tracy in April 1917. Wimmer sold the house to Frederick C. Homann, an Engineering Professor at Montana State College, in October of the same year. A carpenter named Elmer Bartholomew built three houses in the district, beginning with 820 South Tracy in 1917. A prolific builder of modest homes, Bartholomew adapted Craftsman house plans in subtle ways to make his buildings unique. Bartholomew tinkered with the plan set by modifying the roof pitch, shortening the eave overhangs and adding additional architectural details. Bartholomew is attributed with a number of Craftsman style residences in the Cooper Park Historic District and built 810 South Tracy in 1920, and 822 South Tracy 1923. Builder Guy Ensinger began construction of 824 South Tracy Avenue in 1917. American Builder magazine profiled Enisnger that year for his construction of five bungalows, probably on South 6th Avenue in Bozeman (now part of the Cooper Park Historic District). Perhaps Ensinger overextended his business interests; he ran into financial trouble while building 824 South Tracy and sold the project to P.C. Waite, who finished construction in 1918 and offered the residence as a rental for a number of years. The location of accessory buildings in the South Tracy District is unique. Despite the alley to the east of the block, many of the residences share a driveway which brought vehicles from South Tracy Avenue along the shared property line to garages built next to each other behind the houses. 6th Avenue in the same manner the same year. The South Tracy Avenue historic District was nominated to the National Register of Historic Places as a distinct area because its development pattern was unlike the adjacent Bon Ton Historic District. The east side of 800 block of South Tracy Avenue developed between 1916 and 1923, but remained a single block of development for nearly a decade before residences began to be constructed on the west side of the block in the late 1930’s. The neighborhood remained unfinished through the 1950’s, when houses on the 600 and 700 blocks of South Tracy slowly filled in the gaps in residential development. The last house on the block, at 821 South Tracy, was built by H.C. Cheever, director of the School of Architecture, in 1964.